The second generation Barracudas were what the originals should have been right from the start three years earlier. While still based upon modest Valiant mechanicals, the body was differentiated with exclusive sheet metal and body styles now included the requisite convertible, coupe and fastback variants. In addition, “some” luck was with Chrysler in that their corporate torsion bar front suspension system allowed for wider big-block engines to easily be fitted into relatively small cars, and that’s just what their engineers did. 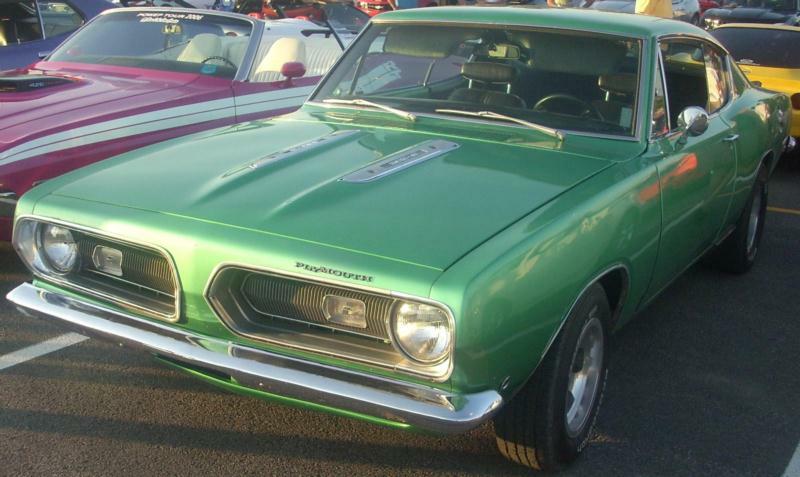 1967 Barracudas could be had with powerful 383 V-8s of 280 hp, but Ford did an end-run around Chrysler again, and offered the Mustang with a 315 hp 390 V-8, while GM offered up to 375 hp in their new Chevy Camaro with 396 V-8, and up to 325 hp in their new Pontiac Firebird 400. “Curses, foiled again!” was probably the cry in Chrysler HQ. Even so, Barracuda sales increased to 62,500 in 1967 from 54,500 in 1966, even with the introduction of new competitors from GM. 1968 saw a modest power gain for the 383, to 300 hp, still not “up there” on paper with the competition, and 1969 saw another gain for the Barracuda 383, to 330 hp. In reality, the 383 was a very strong, torque-infused engine and performance was scorching. Torque counts for acceleration, horsepower for top speed. The limitations of the small body width that wouldn’t allow the tall deck big-block or Hemi engines to be fitted would be fixed for the next generation but could not be addresse given the limitations of the base car used in this generation. These cars are widely considered to be some of the cleanest looking of the “trim” sized Barracudas, and are fully capable machines especially if massive power is not demanded. The small bock 318 engines were available, and by this time, these engines were based upon the more modern architecture of the 273 engines introduced in 1964. Handling for these small-block cars was handily better than the equivalent cross town rivals, but in this era it was largely straight line performance that counted. Convertibles are very rare, and likely to continue to appreciate handily, especially in 383 guise.